It was one of the occasions where almost everyone is a Sanskrit scholar, or at least a lover of Sanskrit. The occasion was the book release of a translation of Adi Sankara’s ‘Sivananda Lahari’ by Dr. Rama Venkataraman* and Dr. Uma Krishnaswamy. The book, a bilingual translation, has been published by Vidya Vrikshah. It is a neatly arranged distribution of labour – Rama has translated the verses into Thamizh and Uma has translated them into English. Each page has one sloka, with its transliteration, the translations in Thamizh and English, and additional notes at the bottom. The book has two explanatory chapters, written by S. Somaskandan, retired Registrar of Benares Hindu University. A learned Sanskrit scholar, he is Rama’s father. This is Rama’s third publication in three years - the first one was the translation of stories from Devi Bhagavatham into Thamizh and the second, ‘Anthyakshri Manjari’, a compilation of Sanskrit slokas for use in Anthyakshari competitions. Rama is a Ph. D. in Sanskrit. Uma is a consultant breast surgeon attached to Apollo Hospital. 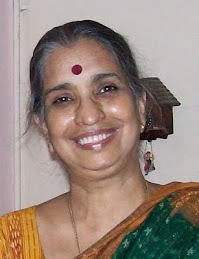 An FRCS from UK, she also holds an M. A. in Sanskrit. Managing a profession that leaves very little spare time, she still found time to translate this work of Adi Sankara. She has also translated the Soundarya Lahiri into English for the Vidya Vrikshah website. 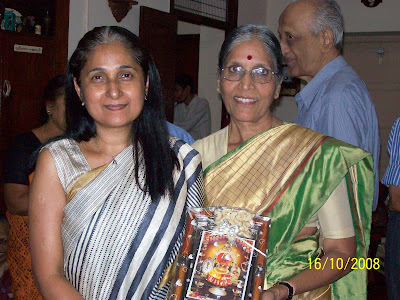 Both women are volunteers at Vidya Vrikshah, a voluntary organization devoted to archiving electronically ancient texts and manuscripts pertaining to Indian religion and philosophy. A special software developed by Dr. Kalyanakrishnan of IIT, Chennai, has been provided free to the organisation for this purpose. Dr. Rama used this software, which allows the English keyboard to be used for typing in various Indian languages, to type the Thamizh translation of all the verses. 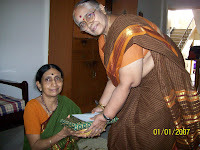 Vidya Vrikshah is run by Uma’s father, N. Krishnaswamy, (IPS), retired Inspector General. The book was released by Dr. C. L. Ramakrishnan, (IPS), Retd. Director of Vigilance and Anti-corruption, who has a profound knowledge of Sanskrit literature, and received by Dr. Kalyanakrishnan. Published in the Mylapore Times dated October 25 – 31. *Dr. Rama is my sister-in-law. The rainy season in Chennai is sandwiched in the three weeks or four between the two main festivals - Navarathri and Deepavali. Old timers in Chennai often point out how it will definitely rain on the last day of Navarathri, and last till beyond Deepavali. This year too, the rains came on schedule – thank goodness, otherwise we would have had to face a drought in the summer. For the last two weeks it has been raining constantly, with heavy downpours off and on, telling us that the north west monsoon is doing its business thoroughly. The festive spirit rules and one can see the enthusiasm of the people, especially when it comes to shopping. 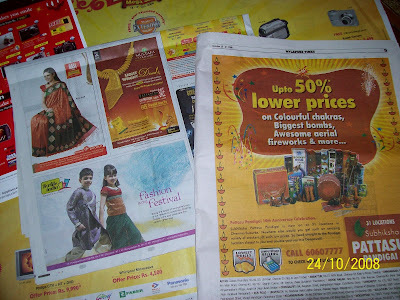 Newspapers, magazines and the television are blazing with colourful advertisements for clothes, sweets and snacks, and firecrackers. Along with these are ads for refrigerators, microwaves, pressure cookers, mixies and so on – because many companies give festival bonuses to their staff now, and they have to be helped to spend it. and made some sweets. Since my mother is here we decided to make her specialty - laddoos, all the while reminiscing on earlier occasions when she made them. My nephew as a little fellow used to refer to them as 'round, round, yellow things'. crackers. And they had to spend it the same day, which meant they got to burst crackers everyday. The major share had to be purchased by their father. One year, my son, fed up of reminding him, left a message for him on the cassette recorder, “‘Appa dappaskku thuttu tha’ (Father, give us money for the crackers).” Repeating it faster and faster till it reached a crescendo. And played it constantly. whatever we got, even if it was tailored by me. But sweets and savouries were another matter. They used to love sweets, and would request their favourites to be made – some of which can be made only by professionals, or at least, not by me. And the kitchen would be a scene of active preparation for up to a week ahead. (Sweet shops and professional caterers were not so much on the scene then). The finished products, whether hit or miss, were consumed happily - along with the goodies brought by our neighbours and relatives, with whom we exchanged ours. arrived, there were special programmes on Deepavali, and the interest in seeing movies in theatres waned. In recent years I have seen it pick up, however. That frenzy of activity is missing now in our pre-festival days. But when friends and relatives with young children visit on the day, we once again get a whiff of that innocent happiness of childhood. Swarna sent me this link. Listen to the joyous melody of Deepavali. 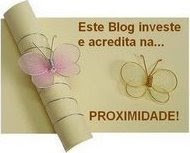 http://psuseela.tripod.com/sus13.ram. It was a nice coincidence. I read Swarna's post on English and this fine piece in Madras Musings practically simultaneously. Why shouldn’t the plural of pan be pen? Why shouldn’t the plural of booth be beeth? But though we say mother, never say mrethren. But imagine the feminine, she, shis and shim! Ullasam pongum inba Deepavali” (roughly this means, let us both sing and dance and celebrate Deepavali’) will be broadcast and telecast, as it has all these years, every Diwali, for almost 50 years. This was part of my comment on fellow blogger GVK ’s post on the movie Kalyana Parisu. C. V. Sridhar, the director of the movie, died earlier this week. He was barely 30 when he directed it. And this was the movie everyone remembered when he died – it was his first, a trendsetting movie in Thamizh which shot him to fame. It had a fantastic story line, good acting, great music, an unforgettable comedy track, and no villains. 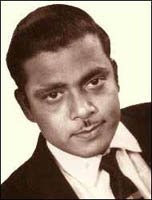 Possibly for the first time, established villain actor M. N. Nambiar played a benevolent benefactor of the heroine. The first Thamizh picture to run for 25 weeks. And as with all first timer achievers, a lot was expected of him in his next films, and to be fair to him, he managed to justify those expectations with something new in every picture. As a young girl, I used to wait eagerly for announcements of his forthcoming pictures. He concentrated on social themes, and his denouements always had an element of surprise, without a conventional ending. His finger was on the collective pulse of Tamilnadu, and he pulled at their heartstrings with moving stories - Nenjil Oru Aalayam, ( picturised in 20 plus days on a single set with no established actors), Meenda Sorgam, Policekaran Magal, Sumatihaangi, Nenjirukkum Varai ( no makeup for the actors in this, not even Sivaji) were some of them, and all of them hits. But he could create a riot in comedy too. Then Nilavu in black and white, starred Vyjayanthimala and Gemini Ganesan and was newsworthy because it was the first Thamizh picture to be shot entirely on location in Kashmir. He excelled himself with the youthful Kathalikka Neramillai in colour, with fresh faces for the main roles. Non-stop laughter from moment one with sizzling music, people saw it repeatedly in the theatre. He directed Sivaji Ganesan in more than one movie and MGR in Urimai Kural. And Rajnikant and Kamalahasan in Ilamai Oonjaladukirathu. But he did not need stars for his movies to be hits. The story was always the star. In fact he introduced to the screen some of the famous names today, the most important one being Jayalalitha in Vennira Aadai. Apparently he had tried Hema Malini (given her a screen test) for a role, and found her unsuitable – Homer nods! – and she went on to make her name in Hindi pictures. Later on, he did make a movie with her in Hindi, I read, but I am not sure. He remade some of his hits in Hindi - like Nazrana, Dil Ek Mandir, and Pyar kiye Jaa. This Deepavali, the sad version of the song will be more appropriate. Ennai kandu nee vaada,kanneerum kathai sollum deepavali "
‘Let us both, you and I, weep for times past, this Deepavali’. This is the question that is at the back of my mind when I wake up every morning. The power goes off promptly at 6 am and doesn’t return till 7.30 am nowadays. Following the recent rules of load shedding on account of power shortage in the state, it used to go off for an hour from 10 to 11 earlier, but after a welcome break of no power cut, one fine morning at 6, it just went off. We waited a while thinking it might be one of the routine grid changes, but we waited, and waited, and the power did not come back. All routine work of the household was at a standstill. We kept trying the Electricity complaint number, and found it engaged. My sister-in-law called to ask if there was power at our place – she lives next door. I told her the situation, and that I could not connect to the Electricity Department either. A few minutes later she called to say that she had called the Electricity people , and they had told her that this was the new schedule of load shedding – 6am to 7.30 am. I gasped! The motor had not been switched on to pump up water from the well. The geyser could not be switched on for hot water for our baths. The mixie could not be used to grind the chutney for breakfast, or the coconut for the curry. The idlis could not be steamed in the rice cooker, but that wasn’t so bad, because I could use the gas and the pressure cooker. 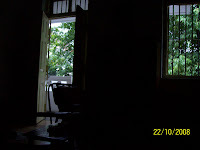 We could not read the newspaper, because the house is rather dark even at 6.30. The cordless phone could not be used. I could not check mail on the PC. There we were, stuck, unprepared and at a loss. It was not so bad for us because there are just the two of us retired folks and my mother here, not in a hurry to go anywhere. But imagine the plight of households where people have to go to work, and children get to school on time, especially in multistoried flats – the lifts won’t work! But the human(read our) spirit is resilient and finds ways to overcome the problems. From the next day, we switched on the motor at an earlier hour, checked mail before 6 am, and decided to postpone baths and cooking till the power returned. We try not to switch on all the appliances at the same time for fear of a heavy load causing a fuse to go off. The resultant free time we spent on reading the newspaper from cover to cover, including supplements, exchanging the sheets, sitting as close to the windows as possible. After that, I decided to do some fine tune dusting and cleaning. Not my favourite chore, but well, it has to be done some time, and this was as good a time as any. My mother chose to knit, and my husband some reading. And so it went for a few days, when one morning after hurrying through the pre-power cut routine, we found that the power did not go off at 6. Well, well, we were elated, but not sure if it would go again at some later hour, for which we would not be prepared. But, oh great wonder, and thanks be to the powers (!) that be, it did not go off at all. Nor on the next day, nor yet again on the following days. Happy days are here again, we sang, and were lulled into thinking that the days of power cuts were gone. We went back to our original routines, without the hustle and bustle between 5 and 6 am, starting work in a more leisurely manner. Then one day, with the motor not switched on, the water not heated, the mail not checked, suddenly the power went off without warning, and we were caught! And since then it has been so – power-less on some days, and power-ful, on others, we never know till 6 am – if it is going, it goes on the dot of 6. If not, hey great! Am I complaining? I dare not. Ever since my husband returned from a visit to Thiruvannamalai a couple of weeks ago, and told me that the power cut there lasts five hours, I have kept mum. Now today the papers say that there is a new strategy from the Electicity Board to encourage less consumption – double the charges beyond a certain limit. My brother sent me a link to an article on dictionaries that triggered off memories in both of us . . .
“Am I a walking dictionary?” my father used to ask when we asked him for the meaning of a word. He would point out to the bookshelf and say, “Find out for yourself.” And thus we were encouraged to use the dictionary from early on. A perfectionist, who liked everything just so, he would tick us off us for mutilating books with pencil marks or treating them roughly; the only thing he did not object to was a dog-eared or even tattered dictionary. “That shows you have been using it,” he would say, and not think twice of replacing it when it was beginning to fall to pieces. A fascinating read it has been, and on-going still. I look a word up, maybe for meaning or pronunciation, and end up going down the columns at more and more. New words are often seen, recorded and put aside for future appropriate use. Words you thought you knew well, throw up more facets. Some words I thought I knew meant the opposite of what I thought - that is how I found several doesn’t mean many, but only more than two! Roots and origins are explained and some dictionaries even give examples. The old Chambers we have has interesting supplements like meanings of Christian names and foreign phrases. And if you just happen to meet an English aristocrat, and don’t know how to address him, why, you can simply look it up in the supplement ‘Correct Ceremonious Forms of Address’. You can even check out the Metric system here. It is well-thumbed, and has been bound more than once (several?) and is still a favourite. But, published in 1901 and revised in 1960, it doesn’t have many current phrases, let alone current technology. So we added a new dictionary that included those. 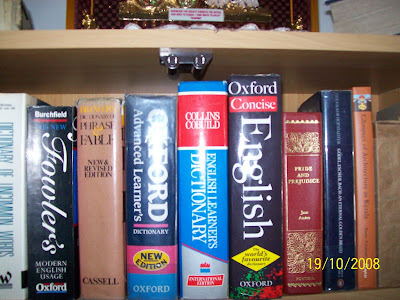 And somehow or the other over the years , our collection (including gifts) has grown, and we now have five dictionaries at home (not counting the language ones). Apart from these, my mother likes to use her own lightweight dictionary to verify spellings before she fills in the daily crossword. 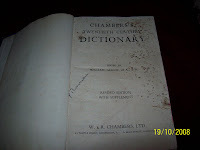 I like to read about the origins of words and phrases and found this book (not actually a dictionary) extremely interesting – Brewer’s Dictionary of Fable and Phrase (it belongs to my son, who won it at an inter-collegiate event). A trivia lover’s delight, it gives explanations and origins of phrases and has a lot of cross reference too, so you can lose yourself happily for hours in it. One of the anecdotes in our family is about my father's cousin, who used to visit us frequently. If he found my father out, he would sit down to wait, and pick up the dictionary to read. I can now quite understand his fascination for it, but what made us laugh was that another of his favourites was the telephone directory. What lurking attraction drew him to that list of Sharmas and Varmas was beyond us, and made us doubt even his preoccupation with the dictionary. CORE BANKING, COFFEE POWDER AND RUPEES TWO. All work at the bank is conducted by my better half. And no complaints. I am not intrigued or fascinated by the intricate workings of the system, and am content to benefit from the fallout of the procedures. But last week, I had to take a trip to the bank at the request of my husband. “Since you are going that way, why don’t you deposit this cheque?” he said. “Of course,” I said cheerfully. Whereupon he gave me several instructions on what to do, what to say and how to present the cheque, by which time my enthusiasm had died down, and I had started bristling. I may not actually enjoy going to the bank, but I do know a little - my days in the office had also entailed some banking work, which he seemed to have forgotten. So I took the cheque and went to the bank. Upon presenting it I was told that I needed to give two Xerox copies of the cheque as well. When I asked why, I was told it was a ‘foreign cheque’(her words), and so they needed Xeroxes. Now, why had not my mentor and guide mentioned that, I wondered. But I persisted anyway and told her they had never wanted Xeroxes before this. She told me that now they were into core banking, and hence they did nothing at this branch. Core banking? I must have looked lost, when she told me that I could have the copies made at the basement shop, and waved me off. I nodded and left. I decided to do it later after finishing my other work. And when I returned I found I had no money in my handbag. Hmm, in all the flurry of getting instructions on depositing a cheque, I had forgotten to pop in my change purse. I did not feel like returning home to get the money, but I did want to finish off the job. And there was my coffee powder shop, Sarasu Coffee, next door to the Xerox shop. Bhaskar, the owner, was there and I decided to ask him for a loan of Rs. 2/ -. He was only too happy to oblige and insisted on escorting me to the Xerox shop and telling them my requirements. After finishing my work there I went back to Sarasu and thanking Bhaskar, took leave of him. But he would not let me go, and insisted on buying me a cool drink. “You haven’t come here in so long,” he said. I told him it was his own fault - such good service and prompt delivery. Bhaskar is a one-man industry. He takes orders on the phone, roasts and powders the beans, and delivers the powder. I only have to call him on the phone and say, “Sankar’s place, Bhaskar”, and the coffee powder is delivered - he knows my requirements. After all I have been his customer for the last 25 years. His hospitality left me with a warm feeling, and I don’t mean the Madras heat. I returned to the bank, finished presenting the ‘foreign cheque’ and walked home, pondering on core banking and mom-and-dad shops. Last week, on Vijaya Dasami, when our van landed at Sri Sai Temple (in Krishnakarani village) on the Mahasamadhi Day of Sri Shirdi Saibaba, and unloaded a group of not so young ladies, we were taken for a group of devotees who had come in from Chennai. That too, of course, but we were there in our capacity as musicians, a group of singers known as Gangamritham, trained and led by guru Ganga, to perform on the Mahasamadhi Day. This year it was on Vijaya Dasami, the tenth and last day of Navarathri, and also on a Thursday, a day special to Sai Baba. We were highly pleased with the honour, and had been rehearsing diligently for weeks, squeezing in rehearsals between Navarathri kolu celebrations and visits, children’s exams and regular housework. 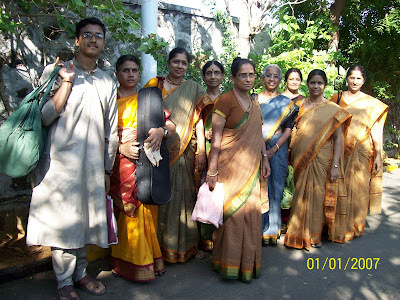 We had also decided to dress in similar, if not identical sarees, and made time after one practice session to go shopping. We spent our time happily selecting, giggling and chatting like schoolgirls, before deciding on our choice - and here we are. On Vijaya Dasami, the auspicious day to start all new lessons, we met at guru Ganga’s place and honoured her in the traditional manner. She taught us a new song, to signify the auspicious start. And we got into the van provided by our coordinator Usha Gopal, and picking up our accompanists, Usha Venkatesh and her son Karthik, set on the almost two hour trip. It was a fairly hot afternoon, and we were glad to reach our destination. 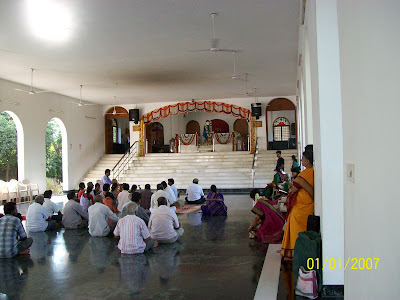 The temple (near Mahabalipuram) is run by Shirdi Sai Trust, and is set in a huge campus with spacious buildings surrounded by lots of greenery. We waited in the huge hall where there was the life size image of the Baba, and where a bhajan group from Andhra was singing. The breeze from the nearby sea, barely a few yards from where we were was non-existent. But the hall was cool and airy. We were served coffee before we sat down to sing, not on a stage as we had thought, but on the floor in the hall, where the bhajan group had also been singing. The listeners were behind us, so we could not see who or how many. We sang a few well chosen kirtanas and bhajans, not too long or heavy, each one dedicated to a different God. After the concert, which lasted for about an hour and a half, we heard some applause, and turning round, were delighted to see that the hall had filled up. Of course many of them were devotees waiting to see the aarathi which was to follow our concert, and so was a captive audience! 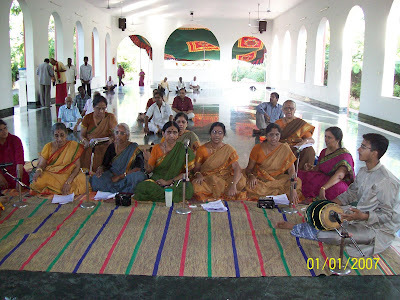 We were totally taken aback when after the concert, the priest came down from the stage where he was getting ready for the aarathi, and presented each of us with a ‘ponnadai’, a kind of shawl with golden weave, and considered the ultimate form of honour. More applause followed, and in my confusion, I forgot to tell our unofficial photographer Sudha to take a picture of the honour! We also got DVDs on the life of Baba and a nice picture, and a cash reward. After the arathi, everyone present was fed a substantial, if not fancy, meal and we too partook of the ‘prasadam’, as it is called. On the return journey, comparatively cooler for it was night by then, we were on a high, with the satisfaction of a job well accomplished, and feeling that our efforts had been well appreciated. Forgot to set the date on the camera! The correct date was October 9, 2008. 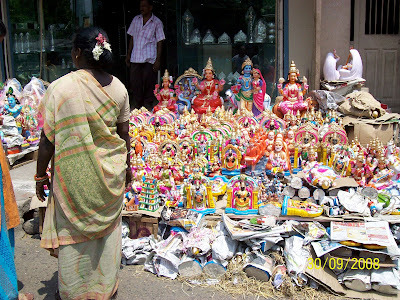 Navarathri may have come and gone*, but Kolu lovers will love this - pictures of various kolus in the Mylapore area of Madras. 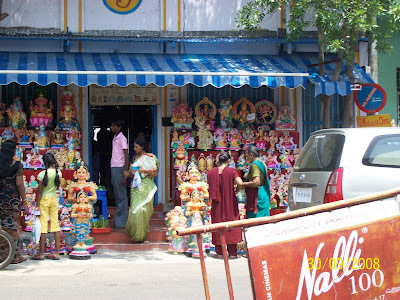 This is at kutcheribuzz.com, and is presented by the neighbourhood newspaper Mylapore Times. The photographs have been taken by R. Saravanan. 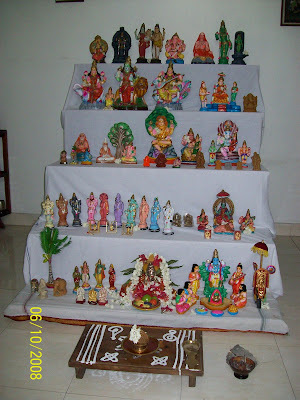 One cannot help but notice how each kolu has a theme. *This post would have been up earlier, but for my erratic service provider. Once upon a time, my Navarathri evenings were filled with visiting the kolus of other people – neighbours , friends and relatives. Now the invitations have dwindled, as also the visits – a kind of poetic justice! When I was very young I would sulk my way through the Navarathri days, and upon my mother’s insistence, (in those days one did not dare to disobey mothers,) get dressed in colourful pattu pavadai and visit other people’s kolus, and invite them to ours. 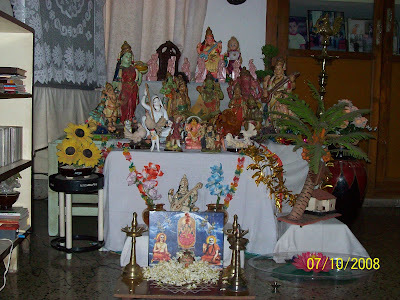 I have never arranged a kolu, despite my mother’s wonderful ones. Her recent post on her blog, revived nostalgic memories in all of us, her children, and other readers too. I remember how much effort she put into each one of them, and her enthusiasm was infectious. There we were, all five of us, and the domestic help too, chipping in with our own contributions. 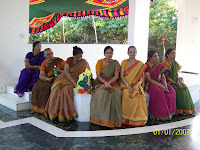 One of the pre-kolu activities was the making of paper garlands to decorate the canopy over the kolu. We would start days before the actual kolu. All of us remember this activity clearly. Coloured crinkly paper (called crepe paper) would be cut into three inch squares, and piled in small batches. The two opposing sides of these squares would be snipped up to an inch, forming a fringe on either side. These would then be rolled at the unsnipped centre, so that the fringed sides would open out like petals of flowers. These were strung together with twine, or slender threads of rope, Every year fresh garlands were added to the existing pones, and there would be enough to drape over the sides of the steps. A riot of colours. We would all do our bit, with even the youngest ones would diligently form the flowers by crumpling the centres. The festooning of the garlands was left to the boys. 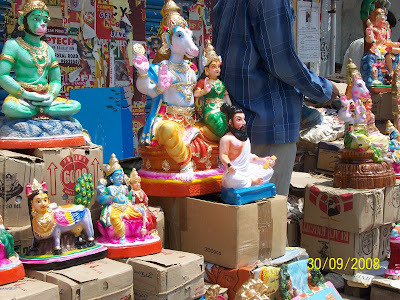 Pieces of cardboard, matchboxes and cigarette cartons were used to make doll sized furniture, and temple towers, or walls, which would then be painted over or pasted with colour paper. 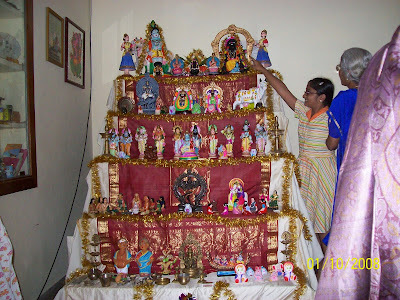 I was willing to help all I could with all that, but deck myself up and visit or invite people to our kolu was something I did not do happily, and often left it to my sisters. 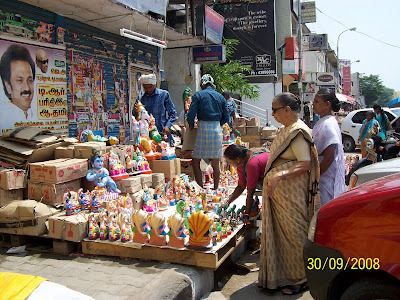 I have noticed that not many kolus have these garlands – the plastic ones, coloured, or gold and silver are readily available in the shops, along with so many embellishments. Even toy sized furniture has been available over the years, eliminating a lot of hard work. This year I even saw ready-made patches of grass (fake) on sale. My mother’s fields were made of sprouted fenugreek, sown in time to come up during the kolu. With all the ready made stuff saving time and labour, people now concentrate on arranging the kolus – they have various themes, and imagination has free play. I was one of the judges one year of a kolu contest, run by our newspaper, and had to visit more than 100 kolus in three days. Phew! But so rewarding. The imagination, the creativity, the artistic adapting of our legends and myths, even literature, the sheer ingenious use of the resources was extremely impressive, and made me feel humble. This year I visited only a few kolus, but all were impressive. 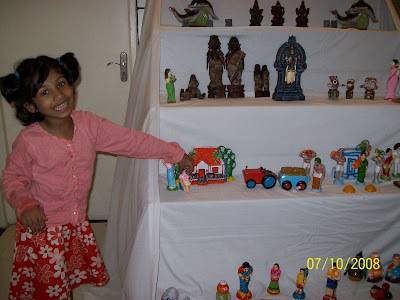 Vidya’s had a good collection of antique toys and playthings, arranged on a silk background.These dolls are playing pallankuzhi! 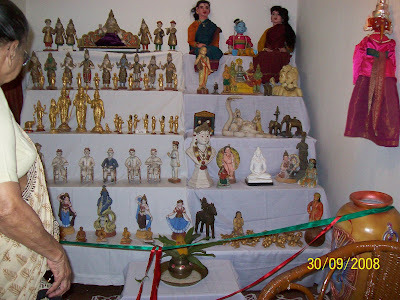 Padmini’s had dolls which were more than 60 years old – she had a whole room devoted to the kolu. 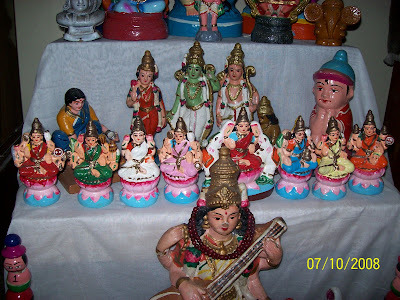 At the C. P. Art Centre a kolu was arranged using the dolls that were used in the family of C. P. Ramamswamy Aiyar’s kolu. The two big dolls on the top shelf have actual hair and wear real clothes. 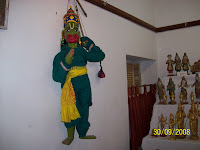 The huge Hanuman is a puppet. 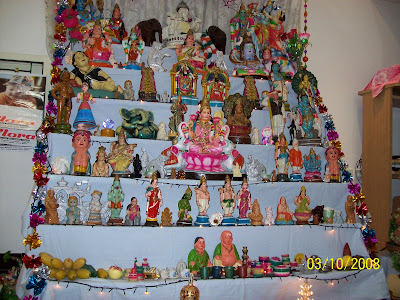 Meenakshi’s collection of dolls were old and new, and arranged neatly. 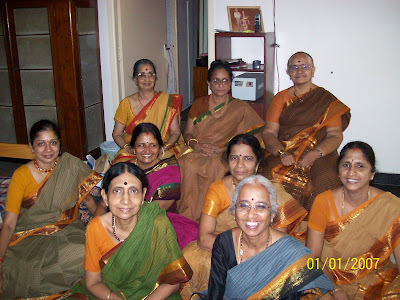 and Girija’s had a set of Ashtalakshmi (eight Lakshmis). Great niece Tushti(topmost picture) showed off all her bommais, giving each one a persona – one was her mother, another her grandmother and so on….. The traditional wooden dolls – Marapachi - were displayed in four sizes. 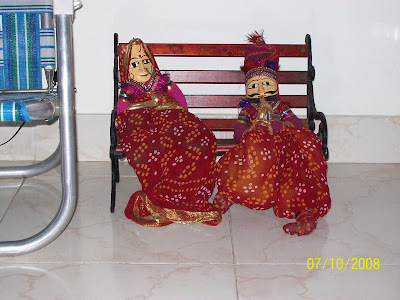 At Padmini Vaidyanathan’s there was no kolu, but these two puppets, about 18 inches high, seated on a teeny bench to fit their size, caught one’s eye. The welcome one receives at kolus, and the hospitality, followed by the auspicious send off with turmeric, kumkum and sundal (cooked beans) does warm the cockles of one’s heart. P. S. All these pictures can be enlarged - just click on them. 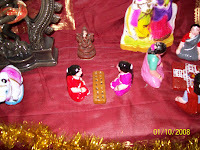 It is called Navarathri, nine nights of celebrating the Goddesses Lakshmi, Parvathi and Saraswathi, here in Tamilnadu. Elsewhere it is Dussehra, celebrating Ramlila, or Durga Pooja in Bengal – all festivals blazing with colour and revelry, celebrating the triumph of good over evil. Simplistic Hindu faith. 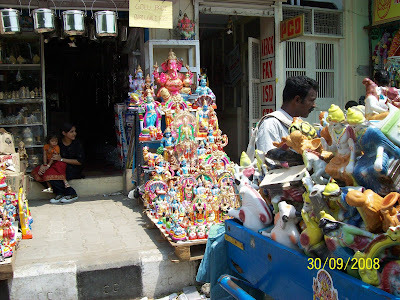 In Madras (as in other places in Tamilnadu) it is celebrated with a kolu at homes, a kind of arrangement of colourful dolls, or iconic representations of gods and goddesses on numerous steps, along with other curios and artifacts. 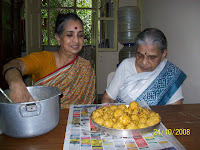 It is the height of socializing for womenfolk, who visit one another and exchange thamboolam (the auspicious gifts of betel leaves and nuts, coconut and fruits with turmeric, sandal paste and kumkum- vermilion). No sooner than the wind changes, and the nights start turning cooler, shops selling the dolls sprout up overnight in busy shopping areas. The area around Sri Kapali Temple is the ultimate example. 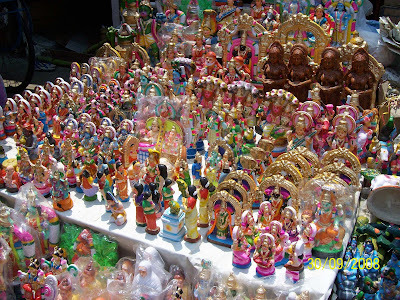 The pavements are crowded with different vendors displaying their wares – all arranged in step fashion, so that they themselves look like kolu. My mother and I went to look for ourselves. My mother whose kolus were real works of art, enjoyed looking at the dolls. Here she is, at one of the shops still setting out its wares, enjoying one of the butter-eating Krishna. There are representations of all the major Gods and Goddesses, painted with brilliant colours, attracting the passersby to stop and look again, even if they don’t buy. 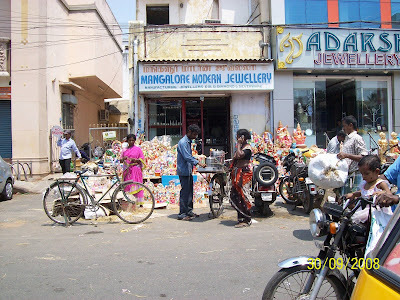 The sellers are mainly city dwellers who get their wares from anywhere – Cuddalore, Bunrooti, Ponidcherry, said one of them. Some of them were reluctant to talk, since business was picking up right then. But one of them told me that they are all mostly fruit sellers, who change to doll selling for the season. Higher prices did not deter many – the vendors expected their customers to bargain and bargain they did. The pavement shops block sizable chunks outside the regular major shops. I asked one of the jewellers, whose space outside was hosting one of these, if they asked him before setting up shop. He said, “They did the first time, and since then they come every year and occupy the space without asking. But they won’t let anyone set up shop here – it is as if they have an unsigned lease! The whole family takes turns to keep watch.” He did not seem to mind very much, though. 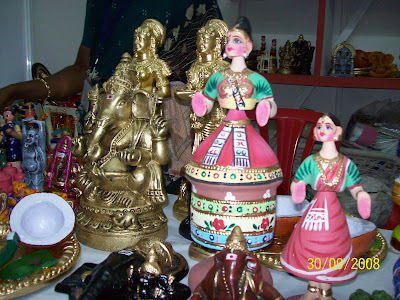 At one of the wedding halls nearby, there was an exhibition of the products of women’s self-help groups, which also had dolls and other interesting objects (unconnected with Navarathri) for sale. 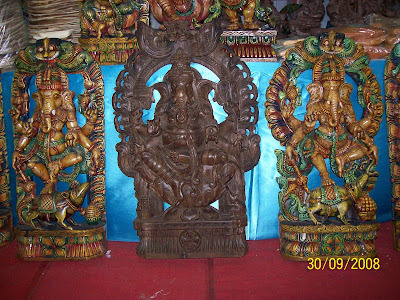 The idols of Ganesha(above), carved in wood and painted, are more than three foot high. 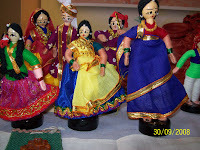 And the little dolls (left) wearing colourful costumes, not more than six inches high. I have also heard of a similar festival in Japan called Hinamatsuri, where dolls are arranged on tiers. Makes one wonder if there was a common starting point for both. There is nothing like our festivals – a perfect balance of religious and social features - with their bright colours to make our spirits soar.